Best for getting and staying motivated to quit smoking‚ as well as averting cravings‚ cleansing the body of free radicals and staying calm and relaxed. A trio of Lavender‚ Lemon‚ and Peppermint. Using essential oils is intuitively simple and highly satisfying. However‚ the many oils available with their numberless combinations and wellness applications can be a bit overwhelming to beginners. As a simple first step on your journey with essential oils‚ we recommend a trio of lavender‚ lemon‚ and peppermint‚ three of dōTERRA' most popular oils. They will provide you and your family a compelling experience with the life-enhancing properties of therapeutic-grade essential oils. Introductory Kit: (5 mL bottles) *** each bottle contains 100 drops; making these just pennies per "dose"
Lavender - calming and relaxing properties that promote peaceful sleep and ease feelings of tension. Lemon - provides cleansing and digestive benefits and supports healthy respiratory function. Also, improves mood. Peppermint - dōTERRA Peppermint essential oil sets it apart from others when it comes to quality. Helps with cravings and promotes healthy respiratory function. Get the book that's changing the way people quit ... anything. This book is for anyone who has ever wanted to break free from any "bad" habit. As you read this compelling story‚ you may wonder‚ "Could I quit, too?" If you are like many people all over the world‚ you'll find the answer to be "YES!" This is a great kit to experience a variety of essential oils that can also be used for quitting and overcoming cravings‚ as well as lead to a healthier life before‚ during and after quitting. Enroll with this kit to experience a variety of essential oils that can also be used for quitting and overcoming cravings. AromaTouch Kit: (5 mL bottles) *** each bottle contains 100 drops; making these just pennies per "dose"
Melaleuca - best known for its purifying qualities, which make it useful for purifying the air or promoting healthy immune function. On Guard - can be taken internally on a daily basis to maintain healthy immune function and support healthy cardiovascular function. AromaTouch - provide relaxing and comforting effects. Deep Blue - serves as an enriching blend of oils perfect for a massage after a long day, an intense workout or just a stressed out day from making it through cravings. Wild Orange - possesses stimulating and purifying qualities, making it ideal to support healthy immune system function. Fractionated Coconut Oil (4 oz) - used as a "carrier" oil to dilute essential oils; making them last longer and cost effective. Diffuser - a small, convenient, and night-friendly diffuser with a far-reaching mist designed to help purify and humidify the air around you. Best for those who may have mood swings‚ feel they smoke do to "stressful" lives or situations or want to balance their emotions during and after quitting smoking. 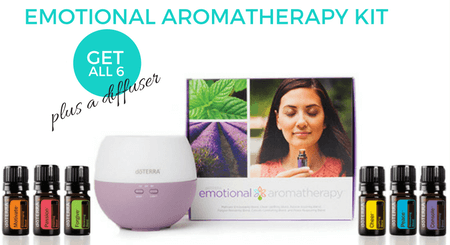 Enroll with this kit to experience the perfect combination of materials to experience the uplifting and emotion boosting benefits of the aromatherapy system. Emotional Aromatherapy™: (5 mL bottles) *** each bottle contains 100 drops; making these just pennies per "dose"
Motivate - feelings of confidence and courage will replace negative emotions like guilt and pessimism. Cheer®- can counteract negative emotions and provide a boost of happiness and positivity when you are feeling down. Passion®- When feelings of boredom and disinterest take over, the doTERRA Passion Inspiring Blend will help to rekindle feelings of excitement, passion and joy. Forgive® - helps to counteract emotions of anger and guilt, while promoting the liberating feelings of contentment, relief, and patience. Console® - uses sweet floral and tree essential oils to promote feelings of comfort, putting you on a hopeful path of emotional healing. Peace® - promote feelings of contentment, composure, and reassurance when anxious feelings overwhelm your emotions. This kit is a perfect companion to assist with healthy living goals and to help boost vitality. More than assistance before‚ during and after quitting — this kit is for those looking to make a healthier life moving forward. Also‚ includes our 4 week online quitting program 100% free! 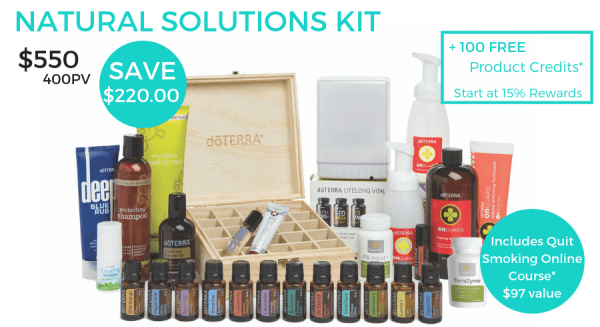 New dōTERRA Wellness Advocates who enroll with a Natural Solutions Kit (400 PV) and have a 100 PV Loyalty Rewards order the following month* will receive 100 loyalty points and start loyalty point accrual at 15 percent. PastTense® (10mL bottle) - To help ground and balance emotions, PastTense uses a fresh, cooling aroma that can ease stressful feelings and promote a sense of calm. On Guard® - can be taken internally on a daily basis to maintain healthy immune function and support healthy cardiovascular function. Frankincense - As the "king of oils", Frankincense is known to support healthy cellular function. When applied topically, inhaled or diffused, Frankincense promotes feelings of peace, relaxation, satisfaction, and overall wellness. Balance® - creates a sense of calm and well-being. DigestZen® - aid in the digestion of food, soothe occasional upset stomachs, and reduce uncomfortable gas and bloating. AromaTouch® - provide relaxing and comforting effects. Serenity® - perfectly balanced, tranquil blend can be felt immediately, transporting the user to a state of blissful repose. Breathe® - maintains feelings of clear airways and easy breathing. On Guard Beadlets - perfect for traveling and on-the-go. On Guard Toothpaste - a natural and fluoride-free solution to help clean teeth, reduce plaque, and whiten teeth with gentle polishing agents. On Guard Hand Wash with 2 Dispensers - a gentle, skin sensitive alternative to harsh soaps. Lifelong Vitality Pack® -vitamin and supplement pack full of essential nutrients, metabolism benefits, and powerful antioxidants designed to help promote energy, health, and lifelong vitality. DigestZen TerraZyme® - a blend of whole-food enzymes and supporting cofactors that help strengthen the body's production of enzymes which is important in the process of healthy digestion of food nutrients and cellular metabolism of nutrients to energy. Deep Blue® Rub - a topical cream formulated with Deep Blue Soothing Blend of CPTG Certified Pure Therapeutic Grade® essential oils, natural plant extracts, and additional helpful ingredients that provides a comforting sensation of cooling and warmth to problem areas. Aroma Lite Diffuser - an advanced diffuser with four mist output settings and real-time atomization technology. Breathe® Vapor Stick - unique delivery method of doTERRA Breathe proprietary blend can be used anytime, anywhere to promote feelings of clear airways and easy breathing. Correct-X®‚ PB Assist®+ - a multi-purpose, all-natural ointment that helps clean and soothe skin that is in distress. Salon Essentials® Protecting Shampoo - a professional formula with an invigorating complex of CPTG Certified Pure Therapeutic Grade®essential oils, gentle cleansers, and botanical ingredients that keep the hair looking clean and healthy. Salon Essentials® Smoothing Conditioner - Nanotechnology smoothes hair and provides an antistatic effect that keeps hair shafts aligned during styling for a smooth, finished look. Wellness Advocate Introductory Packet - Detailed educational information about your oils and dōTERRA. *Points will be redeemable 90 days following enrollment. If the loyalty order is cancelled before 60 days‚ the new Wellness Advocate will not receive points awarded. Only first-time Wellness Advocates who purchase these specific enrollment kits qualify for the Loyalty Rewards Fast Track Program. Loyalty Rewards Fast Track enrollment orders are not loyalty orders and will not count towards Power of 3 bonuses or other Loyalty Reward Program benefits. Identify your exact triggers that lead you to smoking; preparing you to quickly and easily know when cravings are most likely to come and how you can overcome them. Train yourself and others how to support you through the quitting process. Build a customized quit smoking action plan that leads you step by step‚ until cigarettes are in your past. Choose and stick to your quit date. Connect to a continually growing support group that will transform you from the person who needs inspiration to the one who inspires others to leave their bad habit in the past. Access weekly progress video calls and direct coaching. 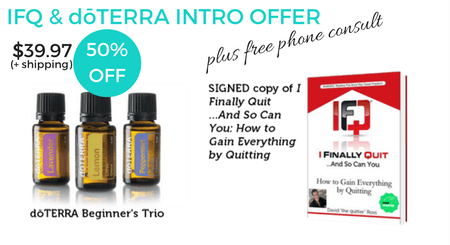 WAIVED AND AUTOMATICALLY ENROLLED FOR NEW dōTERRA ADVOCATES WHEN PURCHASED via I FINALLY QUIT‚ INC.
PLUS‚ after you are smoke-free‚ this 4 week course will pay for itself! The average pack a day smoker saves over $2‚000 ANNUALLY by no longer purchasing cigarettes! What will YOU do with the money you save? Vacations? Car? How will you reward yourself?